BAM has been advertising for this “Shuffle Mode” show with uncharacteristic aplomb, I guess ticket sales have been sloooow so far. Anywho, Sufjan Stevens and Shara Worden have just been added to the bill, so that should drum up some more interest at the box office, I wonder what they will actually be doing. 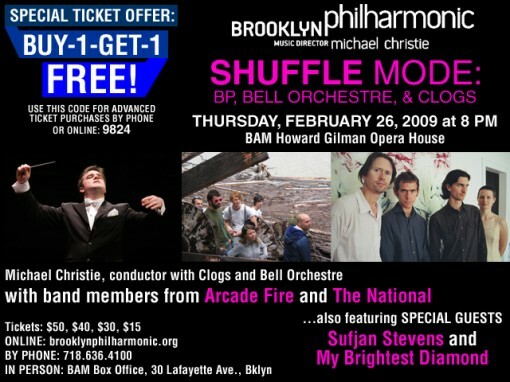 Buy tickets now for SHUFFLE MODE: BP, BELL ORCHESTRE, & CLOGS, and enter code 9824 for a special Buy-1-Get-1 FREE Deal!